This is the time of year when animals are out looking for food and having babies so we are in need of volunteers. 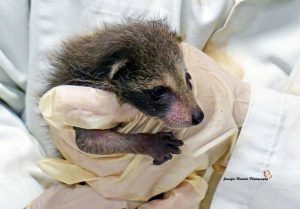 We get no government funding so Procyon Wildlife relies on volunteers to help care and feed our orphaned and injured babies that will be admitted. We are currently looking for volunteers to care for our wildlife at Procyon Wildlife Centre. We provide all the free training needed for you. In fact, there are two training days at the Centre; one this coming Sunday, April 22nd at 2:00pm and the next one will be held on Sunday, May 6th at 2:00pm. The more volunteers we have, the more precious lives we can save. 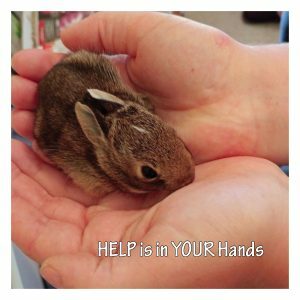 Help is in YOUR Hands. Thank you to everyone who attended our Easter Photo Shoot this past weekend! 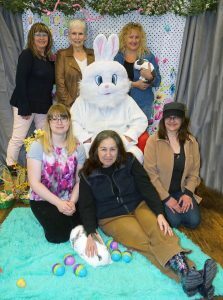 Our Board of Directors – sitting right to left Cat – site manager, Sarah – animal care, Crystal – animal care coordinator Back row right to left Debra – Custodian, Linda – volunteer coordinator and with us are Jennifer our wonderful photographer and the captured bunny is volunteer Dave. Thank you to everyone who attended our Easter Photo Shoot this past weekend! We had a great turnout, and we enjoyed everyone’s smiles of delight – whether two or four legged! We extend our thanks to Wildlife Photographer and Procyon Volunteer Jennifer Howard and to our Easter Bunny, Procyon Volunteer Dave. Many thanks to Rovili’s Pet World, located at 301 Queen Street, South, Bolton, for providing space in their store for the Photo Shoot. All proceeds which were generated go toward the care of injured and orphaned wild animals!